Grilled Cheese is the ultimate comfort food, and this Triple Threat Grilled Cheese sandwich recipe is the absolute best way to enjoy this cheesy classic. 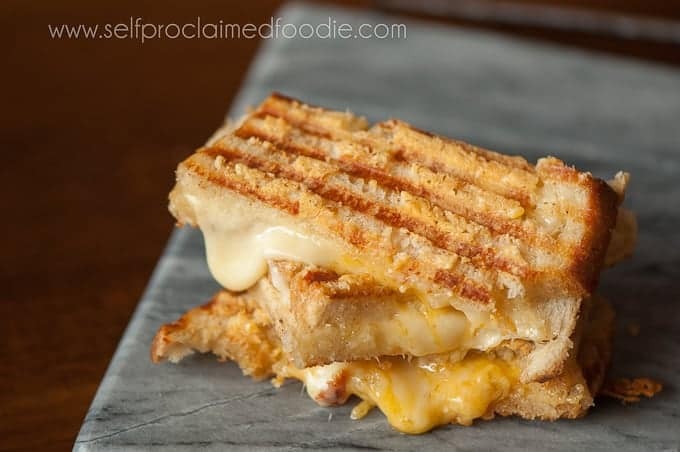 My grilled cheese recipe is a crunchy and gooey sandwich that uses gouda and sharp cheddar melted in between two parmesan encrusted grilled pieces of sourdough. Pin it to your SANDWICH BOARD to SAVE it for later! It is not good for your health, nor is it for the faint of heart. What always matters most? The taste… and this triple threat grilled cheese tastes insanely good. How do you make a good grilled Cheese? 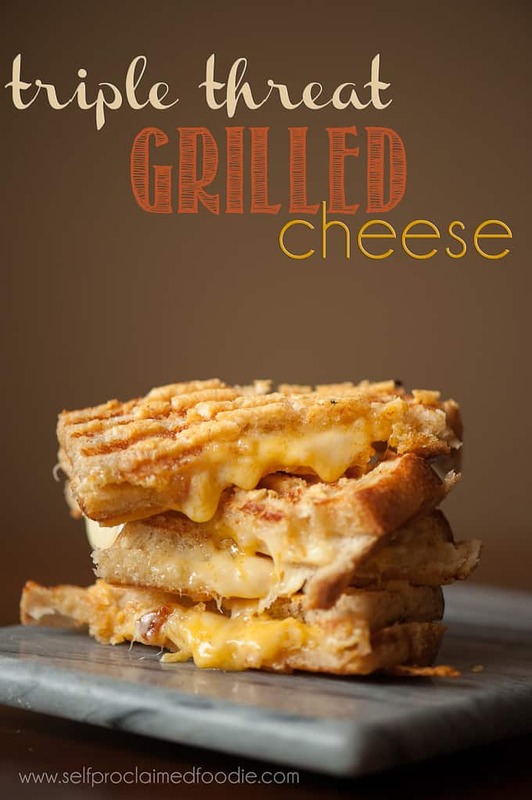 With most recipes, the quality of a grilled cheese has to do with the ingredients as well as the technique. You won’t find kraft american singles melted in between two slices of corn syrup white bread lathered in margarine in my self proclaimed foodie household. For this grilled cheese, I used a strong sour dough bread that crisps up wonderfully. I use good cheeses too. Now for the technique. 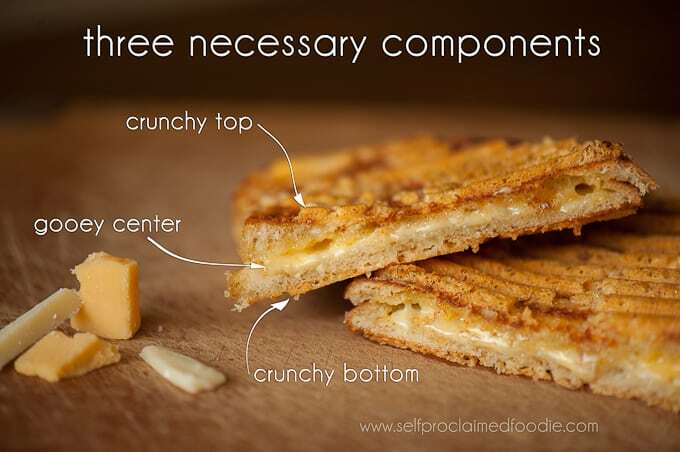 To me, the ultimate grilled cheese is the perfect combination of crunchy-gooey-crunchy. Nothing crunches up more wonderfully than parmesan. What kind of cheese is best for grilled cheese? Like I had said above, the quality of the ingredients that you use greatly affects the final product. That being said, for this ultimate grilled cheese recipe, I used cheeses like sharp cheddar, parmesan, and gouda. That’s why this is call the TRIPLE threat grilled cheese. I find that the combination of these cheeses makes for a flavorful and irresistible comfort food! How do you make grilled cheese without butter? Now I know that some people like to make their grilled cheese crunchy by slathering butter on the bread and grilling it that way, but I’m here to tell you that mayonnaise and parmesan cheese is much better! The combination really adds a nice cheesy, satisfyingly crunchy aspect to your sourdough bread to put mayonnaise and parmesan cheese on the side that you grill. Trust me on this one, it’s delicious! What kind of bread makes the best grilled cheese? You can really use any type of bread to make grilled cheese, but in my opinion, sourdough bread is the best. It adds a great flavor to your grilled cheese and crisps up in a delicious way. I cannot stress enough about how the quality of your ingredients really makes an impact on your overall product. Just imagine taking a bite into some crispy sourdough bread with crunchy parmesan cheese on the outside and ooey gooey cheese on the inside. It makes a difference, and you will see that when you try a sourdough grilled cheese. 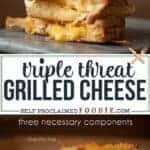 How do you make Triple Threat Grilled Cheese? 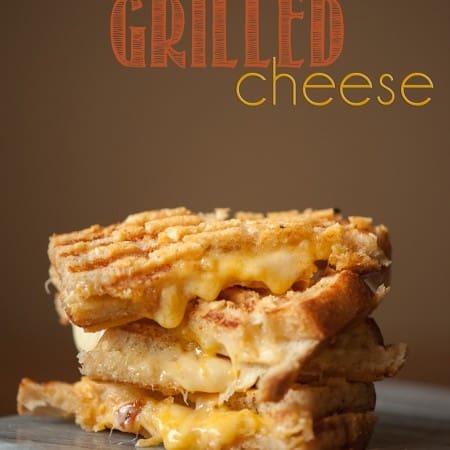 This is honestly the best grilled cheese recipe ever, and I mean it. It’s so unbelievably easy too. To start, you just need to combine your parmesan and mayonnaise before spreading it onto one side of each of the slices of sourdough bread. Next, using a hot panini or stovetop grill, you will place your sourdough bread on it with the parmesan and mayonnaise side facing down onto the hot surface. Then, you will place on layers of slices of cheddar and gouda to make that gooey inside. The last main step is to place the second piece of sourdough bread is placed on top of your layers of cheese with the parmesan and mayonnaise side facing up. To finish this sandwich, you will simply grill on both sides until all your delicious cheese has melted and the parmesan on the outside of the sourdough bread is a golden brown color. I love serving this sandwich with a hot homemade tomato or beet soup. It’s the ultimate comfort food. Nothing quite beats the comfort of a grilled cheese sandwich and bowl of homemade chicken noodle soup. Feeling adventurous and want to close up your arteries? Serve it up alongside some broccoli cheese soup followed by some brown butter brownies. Oh my. This crunchy and gooey triple threat grilled cheese uses gouda and sharp cheddar melted in between two parmesan encrusted grilled pieces of sourdough. Combine parmesan and mayonnaise. Spread evenly over one side of each slice of bread. On hot panini or stovetop grill, place bread with parmesan and mayonnaise side down on hot surface. Layer with slices of cheddar and gouda. Top with remaining piece of bread, parmesan and mayonnaise side up. Grill on both sides until cheese has melted and parmesan is a golden brown. This post was originally created in July 2014 and has been updated with more fun facts and tidbits for your reading pleasure. Try using some McCormicks Garlic Bread Sprinkle on the crust….it is awesome!!! If you like a little punch try using the McCormic Mayo with Lime juice in it. I love it!